Linda joined ALINK Insurance Services in 2004 under its former name of Don Bates Insurance. She began her insurance career in 1975 while living in San Antonio, Texas at a small insurance agency. In 1976 she was hired by USAA to work as a claims transcriber which turned into a 27 year career where she gained experience in claims, the state auto insurance plans, and customer service. 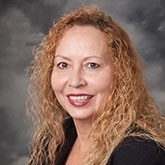 In 1989 she moved to their Rocky Mountain Regional Office and worked as a Senior Service Representative, Accounting Manager, Policy Service Supervisor, and Policy Service Manager. Linda has a Bachelor’s of Science degree in Psychology from Regis University and a Certified Insurance Service Representative “CISR” designation. She is also a former Toastmasters Area Governor. She has two children, five grandchildren, and a great grandchild. She loves spending time by her backyard pond and garden with her Golden Retrievers, Missy and Sophie, and her cat named Boo.